The Misadventures Of Super Librarian: Random Romance Sunday: Or Are You Just Happy To See Me? Random Romance Sunday: Or Are You Just Happy To See Me? ... moreIs It In Wendy's TBR? : Nope. Any Reviews? : 1994, so not really. Although there is one lonely customer review over at Amazon. Anything Else? : What we have here ladies and gents is a title in a Harlequin continuity series. These used to be fairly common, and were break-away series that were separate from the actual existing lines. Which meant their own banner, branding and distinctive cover art. Uh, and it's the cover art that made me highlight this book. First, I'm not sure what the art department was thinking, but all the covers are like this. A separate picture superimposed over a crotch. Which is bad enough - but for the love of all that is holy, won't someone think of the poor baby? And then you have to wonder about the owner of the crotch. I mean, it can't be normal to have a baby exiting through your zipper. Just sayin'. I will say this back cover blurb intrigues me on the Outsider Back In Town Long Enough To Sell Mama's House And Then He's Outta There level. But I'm unlikely to take the plunge because 1) I need another series in my life like I need a hole in the head and 2) Gah, do you know how many Harlequins I have in my TBR already? But for those of you who are interested, RomanceWiki has a complete list of the series, along with the spin-off books that later appeared in the SuperRomance line. As for Ms. Steen, her last book was one of those HSR spin-off titles, in 2005. Lol, I didn't even notice the giant crotch until you mentioned it. Bizarre decision on the part of the art department, I agree. 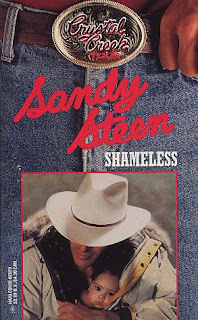 My objection to the cover was that the title "Shameless" does not, to me, say "guy with a baby hidden in his coat." That cover is just...words fail me. It's so freaking bizarre though that I almost feel the need to search out images of the rest of the series just to see if they continue that level of demented design. A Library Girl: Especially a guy with a BORED looking baby in his coat. Poor baby. Lil' Sis: Maybe it's in the family gene pool - because I originally picked a different book in this series BECAUSE of the crotch, then switched to this one when I noticed that poor baby. And Lemon Drop is appearing sometime this week. I still need to do my December round-up. I got sidetracked with "year end" stuff. Marie: There were 20 or so titles in this continuity series - all with crotch covers. The HSR titles that spun off featured your run-of-the-mill HSR titles with a "Crystal Creek" logo slapped in one of the corner.